I want to let you in on some simple advice about using a property search tool, and I can tell you most new buyers do not know this little secret to getting a great deal. The secret regards which properties you should want to go see, and when you should want to see them. After saving your desired features, you will receive email notifications whenever new listings match your criteria. You might find one or two of the new listings interesting and you might even want to schedule a time to see a home. Of course, there is a button for that on our property search tool as well. 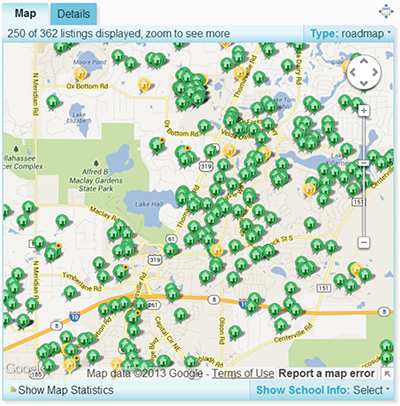 OK, now we can reveal the secret that home buyers should know about using a property search tool. If you find a property that you like, and you click on the "schedule an appointment" button so that you can go see the property, then you need to request a time "today" to see it. If you ask to see it tomorrow or the next day, you are making a mistake. Why? Because the best buys on the market are priced below what they are worth, and they are likely to go under contract today. If somebody lowers their price or lists a new property aggressively in the morning, then it most likely will be gone by days end. You might be thinking "but isn't this a buyer's market?" Yes it is ... for properties priced with or above the market. But it is always a seller's market in real estate when a property is priced below its current value. So if you tweak your settings and monitor the market, any property that really stands out is most likely priced to sell. And that means today! So go ahead and schedule appointments three days out if you just want to see homes that are not yet a great deal, but know that the best deals require fast decisions. You can use our property search tool to find the best deals in the Tallahassee real estate market, and you can use our scheduling tool to ensure that you see them fast. If you have any questions about using our property search tool and would like some help setting it up to find the best deals on the market, just drop me a note and we can schedule a time to help you prepare the tool for your best results.